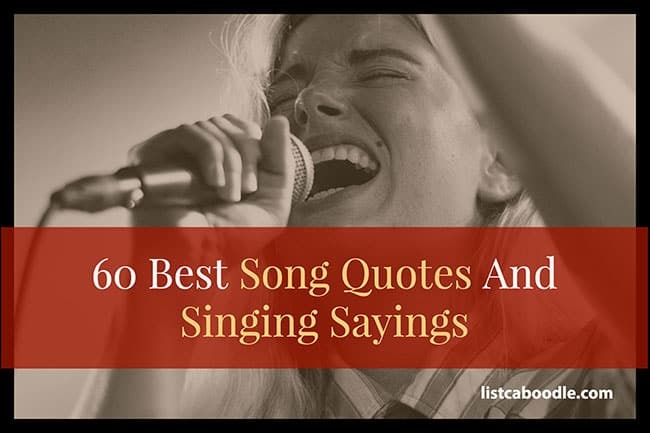 These 60 song quotes and sayings will surely inspire singers of all types. Included are insightful words from artists, musicians and celebrities. Read on and let the words be your muse! Here are some of the best song quotes and singing sayings we’ve found. Enjoy! We don’t just sing; we are the song. To sing is to bring to the surface all the depth of one’s being. Every voice has its own beauty. I love singing. I love it, and it doesn’t feel like a chore. It’s an expression. A song to me is a very tangible thing. I can feel it with my hands and see it with my eyes. You don’t need a reason to sing. Singing is the sound of the soul. A singer… is no more than an actor set to music. Singing, it’s like it’s like loving somebody, it’s a supreme emotional and physical experience. Singing is a miracle. It has been called the most complex coordinative act that a human being is ever called upon to perform. Enjoy your life. No curse hangs over you, nor did it ever. No devil chases after your soul. Sing and dance and be merry. The trouble with music appreciation in general is that people are taught to have too much respect for music. They should be taught to love it instead. If you want to please only the critics, don’t play too loud, too soft, too fast and too slow. If children are not introduced to music at an early age, I believe something fundamental is actually being taken away from them. A singer starts by having his instrument as a gift from God . . . when you have been given something in a moment of grace, it is sacrilegeous to be greedy. We hope you have found inspiration in these music, singing and song quotes. Be sure to check out these other interesting music lists.